About 150 migrants staged a demonstration outside Budapest's main international train station early today as police blocked some 2,000 from boarding trains to Austria and Germany, an AFP reporter said. Meanwhile, about 100 migrants arriving from a registration center near the border with Serbia were sitting on the platform at a suburban train station, refusing to board a train to the Debrecen refugee camp. Some 50,000 migrants have entered Hungary in August alone. This week it allowed thousands to board trains to Austria and Germany but yesterday police suddenly blocked access to the station for anyone without an EU visa. The Hungarian government of right-wing Prime Minister Viktor Orban, which has built a razor-wire barrier along its 175-kilometer border with Serbia, said that it was applying EU rules. But the razor-wire barrier is proving ineffective. 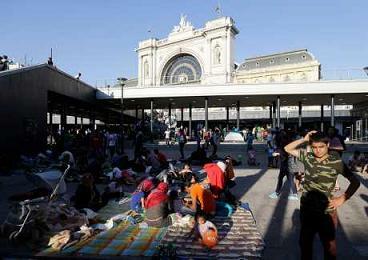 Hungarian authorities said that 2,284 crossed yesterday, including 353 children. “If Europe is letting us in, why don't they give us visas? Why do we have to make this clandestine journey?'' Bilal, a Syrian from the divided city of Aleppo, told AFP yesterday near Serbia's border with Hungary. “We fear that one day everything will change, that even Germany will close the border when it has had enough, so we must make our journey extremely fast,'' he said. Thousands of migrants remain stranded at Budapest's main international railway station as Hungarian authorities are sticking to European Union rules and preventing them from leaving for Germany and other countries west. Around 3,000 migrants were at the Keleti station (Pictured) in the Hungarian capital early Wednesday, many sleeping outside the main entrance guarded by police, who said citizen patrols were now assisting them in keeping order. Volunteer groups accustomed to providing food, clothing and medical assistance to a few hundred migrants at a time struggled with the large number of people staying in every corner of the station's sunken plaza.